As we all know, every network connected device requires an IP address. Whether that address is statically assigned or leased via DHCP, the control of your IP address space is critically important to the the smooth functioning of your network. Most organizations start by tracking IP’s via spreadsheet for convenience and simplicity. However, as they grow this is no longer a feasible (or simple) task to perform manually. There must be a better way! There is- the NMSaaS IPAM solution helps you take control of your IP space by delivering a simple, cost effective means to rapidly assign, track, audit and manage your IP address space. Our IPAM system not only helps you move from spreadsheets to a more manageable system, but it also provides advanced customization. You can fully define all aspects of your IP space including IP address ranges and individual hosts, as well as DNS servers and zones, and DHCP servers and scopes. Our solution is also the first IPAM system to fully integrate with Active Directory (AD). This ensures that your existing AD environment will be fully supported – Out of the box – without any additional effort on your part. Our solution fully integrate with and support the most common IPAM related technologies including: Windows, BIND, Unbound, PowerDNS, Cisco IOS DHCP, ISC DHCP and Kea DHCP, as well as IPAM in Azure and AWS, and DNS services on the NS1, Azure DNS, Amazon Route 53 and Dyn platforms. Our platform also allows for North and Southbound communications via our API’s: REST, SOAP, and JSON-RPC. This means that no matter what you use today for IPAM, or where your network infrastructure is headed – we can support you. The more you see, the more you know. Integrated visibility of network components is the first step to better network security. The NMSaaS IP Address Management Module grants administrators a global overview of all IP address data, combined with comprehensive system health monitoring and the functionality to assign, track, and manage any number of IP address spaces from a single, centralized interface. 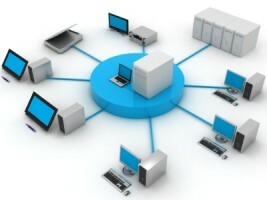 Custom fields for various object types, including IP address ranges and individual hosts, as well as DNS servers and zones, and DHCP servers and scopes, can be defined from within the IP Address Management Module and local changes to configuration and data on DNS and DHCP servers are automatically synchronized and reflected in the NMSaaS IPAM Suite.